It can be a lot of work to run an eBay selling business. As sellers grow, it often becomes necessary to hire one or several employees to help with the listing, customer service, and fulfillment duties that go along with eBay sales. 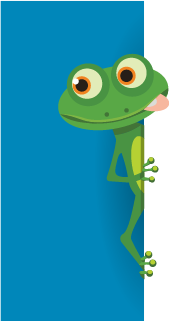 "I don't have enough good words to say about inkFrog and their customer service... With the multiple features they offer, I don't know what I would have done without inkFrog." If you've reached the point at which you need to hire employees, you've probably discovered that there's a problem with hiring employees to help with sales—anyone that has access to your eBay account has access to everything associated with your eBay account. With an inkFrog Unlimited or inkFrog Designer account, you'll be able to hire help and to avoid the worry that comes with giving help full access to your eBay account. Here's how. Log in to inkFrog and open your Settings area. In it, click on the "Staff accounts" option to open the staff accounts tool. Click "Settings" → "Staff accounts" to access the staff accounts tool. The first time you open the tool, you'll be asked to create a unique sign-in URL for your staff or virtual assistant accounts. Enter your store name or another brief word or phrase. This is the URL that your employees will visit to log in. Enter a login URL for your inkFrog staff accounts. Once you've entered a login URL for your staff to use, it's time to create account(s) for them. Click the "Add user" button at the upper-right to add a new account that will enable your employee to log in and do work on your behalf. Click "Add user" to add a new staff account. Enter your employee or virtual assistant's name, email address, and (optionally) phone number. Be sure to enter a working email address for them—the invitation message for their new account will be sent to this address. Enter your employee's name and email address. Check "Limit admin access" to limit their roles. If you'd like your employee or virtual assistant to have full access to all of inkFrog's functions, activate the account and send their login invitation by clicking "Send invite" now. If you'd like to limit their activity, so that they can only perform tasks that you select, check the box labeled "Limit admin access for this user" now. Checking this box opens a new preference panel. If you opted to provide limited access to your employee, read through the preference panel and check (or uncheck) privileges according to your needs and the tasks that you plan to have the staff member perform. Check boxes for the inkFrog areas that the staff member should have access to. Checking a box will give the employee access to the indicated feature. Unchecking a box will prevent them from accessing that feature. When staff members try to access an unchecked feature, they'll see a message indicating that they don't have access to it. If a staff member tries to access a forbidden area, they'll see a denial notice. "Been using this app for almost two weeks now and am very impressed so far! Simple to use, efficient, affordable, and seamless. Well worth my time and my money so far—great work inkFrog!" Dashboard — This box controls the user's ability to view your inkFrog Dashboard. Templates — This box controls the user's ability to access the Templates area. Images — This box controls the user's ability to access your image library. Messages — This box controls the user's ability to read and respond to your eBay messages. Sold (Orders) — This box controls the user's ability to access the sold listings (orders) list in the Listings area of your account. Unsold — This box controls the user's ability to access the unsold listings list in the Listings area of your account. Live — This box controls the user's ability to access listings that are currently live for sale on eBay. Create New — This box controls the user's ability to create new listings inside inkFrog—but not to actually submit them to eBay and make them active. Submit to eBay — This box controls the user's ability to submit listings inside inkFrog to eBay and make them active (i.e. available to shoppers). Edit/Revise — This box controls the user's ability to edit or revise live eBay listings. Settings — This box controls the user's ability to change your inkFrog settings. Applications — This box controls the user's ability to add new inkFrog tools and applications to your account. In most cases, it's wise to prevent regular employees from accessing the Settings area of your inkFrog account. Once you're done configuring privileges for the user you're creating, click "Send invite" to create their account and send an invitation for their new account to their email inbox. Once a staff account has been created, instruct your employee to check their email and follow the link that they find there. They'll be directed to the staff area of your inkFrog account, and will be asked to choose their own password, which they'll use to log in to inkFrog from now on as they do work for you. You can visit the "Staff accounts" tool in your Settings area any time you'd like to see a list of your current staff. Click "Settings" → "Staff accounts" to see your staff accounts. Click on name(s) to edit them. Click on any account in the list if you'd like to change the name, email address, or privileges assigned to it. By creating staff accounts for your employees in inkFrog, you can give them the ability to perform the tasks that you need them to perform, without compromising your actual eBay account, and without the risk that they'll make changes to or access parts of your eBay business that they're not meant to interact with. It's a great way to get help from employees or virtual assistants while preserving your peace of mind. Want to try it? Get inkFrog Now!